Best-selling author and executive business coach Susan Baroncini-Moe reveals her secret behind overcoming anything life throws your way, so you can become more resilient and resourceful at work, recovering from any kind of career setback. In this training program, you’ll discover info that will help you to recover from any setback, master new habits, love your job again, and become a rockstar at work. How to avoid becoming one of the 57% who looks for a new job or quits following a negative performance review at work. How to act on concrete, tangible data and turn everything around so you become a rockstar. How to combat resistance to change… both internally and externally… including how to handle “well meaning” friends and family who may sabotage your growth. All of the training is developed with the latest instructional design principles – which means that everything is designed so that you get results. micro-lessons to help you understand every step in detail, without taking up too much of your time. homework assignments that help you to incorporate each step into your day-to-day life. Sometimes you might journal, sometimes you might think, and sometimes you might take action. emergency tips for when you get stuck so that you never stay stuck. We’ve created three different options so that you can choose the course that works best for your needs and your budget! In the DIY REBOUNDS Course option, you’ll take the course on your own. You’ll have a community of other “bouncers” that you can draw on for help, and a coach/instructor who will be present in discussions to help you stay on track and moving forward. In the DIY REBOUNDS + Virtual Coaching option, you’ll take the course and have access to the community of all bouncers, but you’ll also have access to the Trampoline system, where you’ll have access to tools, like journals, whiteboards, and metrics, as well as a community of other bouncers who are specifically working with a virtual coach as well. You’ll also have your very own virtual coach, who will check in on your assignments, journals, and white boards, offer perspective, hold you accountable, and keep you moving through the course. As a 1:1 Executive REBOUNDS client, you’ll bypass the DIY course entirely, instead receiving a personal, individualized tour of the REBOUNDS program with your own, experienced executive coach. You’ll meet three times a month with your coach, and access the Trampoline system, where you’ll use the journaling, whiteboarding, metrics tracking, and accountability, and where your coach will check in on you throughout the week to keep you motivated and moving forward. You can’t go wrong, no matter which option you choose! If you want to go it alone and learn the 8-step REBOUNDS system on your own, then the DIY Program is the perfect choice. Based on sound instructional design principles that ensure that you truly make progress, the program takes you through each step of the eight steps, one by one. If you want to take the DIY Program but also want access to the Trampoline System, a suite of tools that our executive coaching clients use, and that Susan recommends, as well as a virtual coach who will check in on you each week and keep you moving forward, then you’ll want the DIY + Virtual Coaching Program. 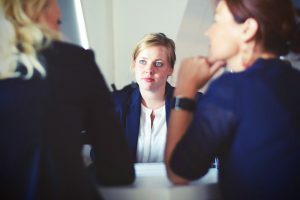 And if you’re a high level executive who wants a personalized tour through the REBOUNDS program, with the tools, then you’ll want to connect with us for your own one-on-one executive coach in the 1:1 Executive Coaching Program.